Masaccio (Italian: ; December 21, 1401 – autumn 1428), born Tommaso di Ser Giovanni di Simone, was the first great Vasari, Masaccio was the best painter of his generation because of his skill at recreating lifelike figures and movements as well as a convincing sense of three-dimensionality. 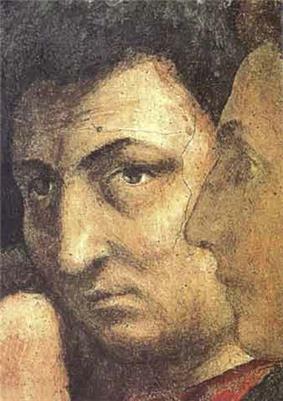 Masaccio died at twenty-six and little is known about the exact circumstances of his death. The name Masaccio is a humorous version of Maso (short for Tommaso), meaning "clumsy" or "messy" Tom. The name may have been created to distinguish him from his principal collaborator, also called Maso, who came to be known as Masolino ("little/delicate Tom"). Despite his brief career, he had a profound influence on other artists. He was one of the first to use linear perspective in his painting, employing techniques such as vanishing point in art for the first time. He also moved away from the International Gothic style and elaborate ornamentation of artists like Gentile da Fabriano to a more naturalistic mode that employed perspective and chiaroscuro for greater realism. Masaccio was born to Giovanni di Simone Cassai and Jacopa di Martinozzo in Castel San Giovanni di Altura, now San Giovanni Valdarno (today part of the province of Arezzo, Tuscany). His father was a notary and his mother the daughter of an innkeeper of Barberino di Mugello, a town a few miles north of Florence. His family name, Cassai, comes from the trade of his paternal grandfather Simone and granduncle Lorenzo, who were carpenters - cabinet makers ("casse", hence "cassai"). Masaccio's father died in 1406, when he was only five; later that same year a brother was born, named Giovanni (1406–1486) after his father. He also was to become a painter, with the nickname of lo Scheggia meaning "the splinter." In 1412 Monna Jacopa married an elderly apothecary, Tedesco di maestro Feo, who already had several daughters, one of whom grew up to marry the only other documented painter from Castel San Giovanni, Mariotto di Cristofano (1393–1457). 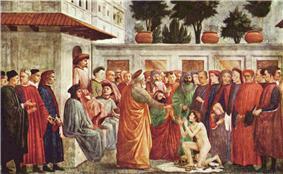 There is no evidence for Masaccio's artistic education. Renaissance painters traditionally began an apprenticeship with an established master at about the age of 12; Masaccio would likely have had to move to Florence to receive his training, but he was not documented in the city until he joined the painters guild (the Arte de' Medici e Speziali) as an independent master on January 7, 1422, signing as "Masus S. Johannis Simonis pictor populi S. Nicholae de Florentia." The first works attributed to Masaccio are the San Giovenale Triptych (1422), now in the Museum of Cascia di Reggello, near Florence, and the Virgin and Child with Saint Anne (Sant'Anna Metterza) (c. 1424) at the Uffizi. The San Giovenale altarpiece was only discovered in 1961 in the church of San Giovenale at Cascia di Reggello, which is very close to Masaccio's hometown. It represents the Virgin and Child with angels in the central panel, Sts. Bartholomew and Blaise on the left panel, and Sts. Juvenal (i.e. San Giovenale) and Anthony Abbot in the right panel. The painting has lost much of its original framing, and its surface is badly abraded. Nevertheless, Masaccio's concern to suggest three-dimensionality through volumetric figures and foreshortened forms (a revival of Giotto's approach, rather than a continuation of contemporary trends) is already apparent. The second work was perhaps Masaccio's first collaboration with the older and already-renowned artist, Masolino da Panicale (1383/4-c. 1436). 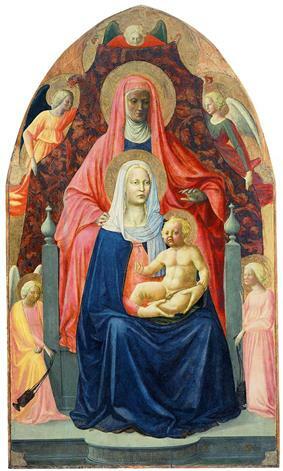 The circumstances of the 2 artists' collaboration are unclear; since Masolino was considerably older, it seems likely that he brought Masaccio under his wing, but the division of hands in the Virgin and Child with Saint Anne is so marked - Masolino is believed to have painted the figure of St. Anne and the angels that hold the cloth of honor behind her, while Masaccio painted the more important Virgin and Child on their throne - that it is hard to see the older artist as the controlling figure in this commission. Masolino's figures are delicate, graceful and somewhat flat, while Masaccio's are solid and hefty. In Florence, Masaccio could study the works of Vasari, at their prompting in 1423 Masaccio travelled to Rome with Masolino: from that point he was freed of all Gothic and Byzantine influence, as may be seen in his altarpiece for the Carmelite Church in Pisa. The traces of influences from ancient Roman and Greek art that are present in some of Masaccio's works presumably originated from this trip: they should also have been present in a lost Sagra, (today known through some drawings, including one by Michelangelo), a fresco commissioned for the consecration ceremony of the church of Santa Maria del Carmine in Florence (April 19, 1422). It was destroyed when the church's cloister was rebuilt at the end of the 16th century. In 1424 the "duo preciso e noto" ("well and known duo") of Masaccio and Masolino was commissioned by the powerful and rich Felice Brancacci to execute a cycle of frescoes for the Brancacci Chapel in the church of Santa Maria del Carmine in Florence. Painting began around 1425 with the two artists probably working simultaneously. For reasons that are unclear they left the chapel unfinished, and it was completed by Filippino Lippi in the 1480s. The iconography of the fresco decoration is somewhat unusual; while the majority of the frescoes represent the life of St. Peter, 2 scenes, on either side of the threshold of the chapel space, depict the temptation and expulsion of Adam and Eve. As a whole the frescoes represent human sin and its redemption through the actions of Peter, the first pope. 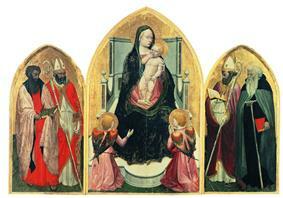 The style of Masaccio's scenes shows the influence of Giotto especially. Figures are large, heavy, and solid; emotions are expressed through faces and gestures; and there is a strong impression of naturalism throughout the paintings. Unlike Giotto, however, Masaccio uses linear and atmospheric perspective, directional light, and chiaroscuro, which is the representation of form through light and color without outlines. As a result his frescoes are even more convincingly lifelike than those of his trecento predecessor. When it was cleaned in the 1980s, Masaccio's fresco of The Expulsion (1426–1427) lost the added fig leaves. The Expulsion from the Garden of Eden, depicts a distressed Adam and Eve, chased from the garden by a threatening angel. Adam covers his entire face to express his shame, while Eve's shame requires her to cover certain areas of her body. The fresco had a huge influence on Michelangelo. Another major work is The Tribute Money in which Jesus and the Apostles are depicted as neo-classical archetypes. Scholars have often noted that the shadows of the figures all fall away from the chapel window, as if the figures are lit by it; this is an added stroke of verisimilitude and further tribute to Masaccio's innovative genius. In the Resurrection of the Son of Theophilus he painted a pavement in perspective, framed by large buildings to obtain a three-dimensional space in which the figures are placed proportionate to their surroundings. In this he was a pioneer in applying the newly discovered rules of perspective. On September 1425 Masolino left the work and went to Hungary. It is not known if this was because of money quarrels with Felice or even if there was an artistic divergence with Masaccio. It has also been supposed that Masolino planned this trip from the very beginning, and needed a close collaborator who could continue the work after his departure. But Masaccio left the frescoes unfinished in 1426 in order to respond to other commissions, probably coming from the same patron. However, it has also been suggested that the declining finances of Felice Brancacci were insufficient to pay for any more work, so the painter therefore sought work elsewhere. Masaccio returned in 1427 to work again in the Carmine, beginning the Resurrection of the Son of Theophilus, but apparently left it, too, unfinished, though it has also been suggested that the painting was severely damaged later in the century because it contained portraits of the Brancacci family, at that time excoriated as enemies of the Medici. This painting was either restored or completed more than fifty years later by Filippino Lippi. Some of the scenes completed by Masaccio and Masolino were lost in a fire in 1771; we know about them only through Vasari's biography. The surviving parts were extensively blackened by smoke. In the twentieth century, the removal of marble slabs covering two areas of the paintings revealed the original appearance of the work. On February 19, 1426 Masaccio was commissioned by Giuliano di Colino degli Scarsi da San Giusto, for the sum of 80 florins, to paint a major altarpiece, the Pisa Altarpiece, for his chapel in the church of Santa Maria del Carmine in Pisa. The work was dismantled and dispersed in the 18th century, and only eleven of about twenty original panels have been rediscovered in various collections around the world. The central panel of the altarpiece (The Madonna and Child) is now in the National Gallery, London. Although it is very damaged, the work features a sculptural and human Madonna as well as a convincing perspectival depiction of her throne. Masaccio probably worked on it entirely in Pisa, shuttling back and forth to Florence, where he was still working on the Brancacci Chapel. In these years Donatello was also working in Pisa at a monument for Cardinal Rinaldo Brancacci, to be sent to Naples. It has been suggested that Masaccio's first ventures in plasticity and perspective were based on Donatello's sculpture, before he could study Brunelleschi's more scientific approach to perspective. Around 1427 Masaccio won a prestigious commission to produce a Holy Trinity for the Dominican church of Santa Maria Novella in Florence. No contemporary documents record the patron of the fresco, but recently references to ownership of a tomb at the foot of the fresco have been found in the records of the Berti family of the Santa Maria Novella Quarter of Florence; this working-class family expressed a long-standing devotion to the Trinity, and may well have commissioned Masaccio's painting. Probably it is the male patron who is represented to the left of the Virgin in the painting, while his wife is right of St. John the Evangelist. The fresco, considered by many to be Masaccio's masterwork, is the earliest surviving painting to use systematic linear perspective, possibly devised by Masaccio with the assistance of Brunelleschi himself. According to the reconstruction  Masaccio started by producing a rough drawing of the composition and perspective lines on the wall. The drawing was covered with fresh plaster for making the fresco. To ensure the precise transfer of the perspective lines from the sketch to the plaster, Masaccio inserted a nail in at the vanishing point under the base of the cross and attached strings to it, which he pressed in (or carved into) the plaster. The marks of the preparatory works are still visible. The sacred figures and the donors are represented above an image of a skeleton lying on a sarcophagus. An inscription seemingly carved into the wall above the skeleton reads: "IO FUI GIA QUEL CHE VOI SIETE E QUEL CH'IO SONO VOI ANCO SARETE" (I once was what now you are and what I am, you shall yet be). This skeleton is at once a reference to Adam, whose sin brought humans to death and a reminder to viewers that their time on earth is transitory. It is only through faith in the Trinity, the fresco suggests, that one overcomes this death. The Holy Spirit is seen in the form of a dove, above Jesus. The combination of trinity, death and decay "can be interpreted as a transposition of the Golgotha chapel" in the Church of the Holy Sepulchre in Jerusalem. Masaccio produced two other works, a Nativity and an Annunciation, now lost, before leaving for Rome, where his companion Masolino was frescoing a chapel with scenes from the life of St. Catherine in the Basilica di San Clemente. It has never been confirmed that Masaccio collaborated on that work, even though it is possible that he contributed to Masolino's polyptych for the altar of Santa Maria Maggiore with his panel portraying St. Jerome and St. John the Baptist, now in the National Gallery of London. Masaccio died at the end of 1428. According to a legend, he was poisoned by a jealous rival painter. Only four frescoes undoubtedly from Masaccio's hand still exist today, although many other works have been at least partially attributed to him. Others are believed to have been destroyed. 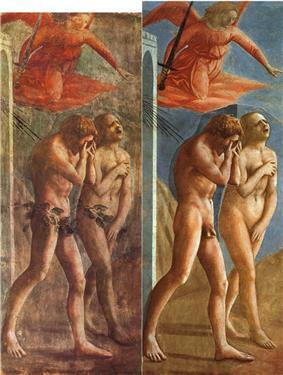 Masaccio profoundly influenced the art of painting in the Renaissance. According to Vasari, all "most celebrated" Florentine "sculptors and painters" studied his frescoes extensively in order to "learn the precepts and rules for painting well". He transformed the direction of Italian painting, moving it away from the idealizations of Gothic art, and, for the first time, presenting it as part of a more profound, natural, and humanist world. 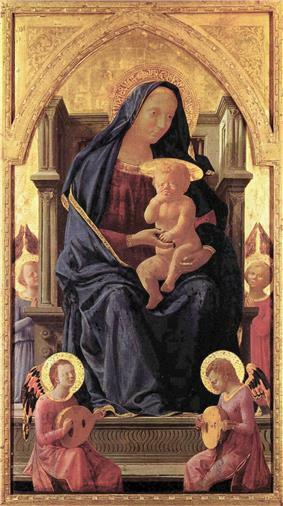 Virgin Mary with pseudo-Arabic halo, by Masaccio (1426). Portrait of a Young Man (1425) - wood, National Gallery of Art, Washington, D.C.
^ Giorgio Vasari, Le Vite de' piu eccellenti pittori, scultori ed architettori, ed. Gaetano Milanesi, Florence, 1906, II, 287-288. ^ John T. Spike, Masaccio, New York: 1996, 21-64, and Diane Cole Ahl, The Cambridge Companion to Masaccio, Cambridge, 2002, 3-5. ^ On Giovanni's career, see Luciano Bellosi and Margaret Haines, Lo Scheggia, Florence, 1999. ^ Vasari (II, 295) implies that Masolino was Masaccio's teacher, but the earliest known work by Masaccio (the San Giovenale Triptych) is painted in a style so different from Masolino's approach that it is hard to tie the two together (Luciano Berti, "Masaccio 1422," Commentari 12 (1961) 84-107. Scholars cannot agree on any teacher for the young artist, though several names (Mariotto di Cristofano, Bicci di Lorenzo, Niccolo di ser Lapo) have been put forward. Recently scholars have also suggested that he may have trained as a manuscript illuminator. Roberto Bellucci and Cecilia Frosinini, "Masaccio: Technique in Context," in The Cambridge Companion to Masaccio, ed. Diane Cole Ahl, Cambridge, 2002, 105-122. ^ Roberto Bellucci and Cecilia Frosinini, "The San Giovenale Altarpiece," in The Panel Paintings of Masolino and Masaccio, ed. Carl Brandon Strehlke, Milan, 2002, 69-79; Dillian Gordon, "The Altarpieces of Masaccio," in The Cambridge Companion to Masaccio, ed. Diane Cole Ahl, Cambridge, 2002, 124-126. ^ Roberto Longhi, "Fatti di Masolino e di Masaccio," Critica d'arte 25-6 (1940) 145-191. ^ Umberto Baldini and Ornella Casazza, The Brancacci Chapel, New York, 1990; Diane Cole Ahl, "The Brancacci Chapel," in The Cambridge Companion to Masaccio, ed. Diane Cole Ahl, Cambridge, 2002, 138-157. ^ Jill Dunkerton and Dillian Gordon, "The Pisa Altarpiece", in The Panel Paintings of Masolino and Masaccio: The Role of Technique, ed. Carl Brandon Strehlke, Milan, 2002, 89-109. ^ Rita Maria Comanducci, "'L'altare Nostro de la Trinità': Masaccio's Trinity and the Berti Family," The Burlington Magazine, 145 (2003) 14-21. Most scholars had thought that the Lenzi family commissioned the fresco: Ugo Procacci, "Nuove testimonianze su Masaccio," Commentari, 27 (1976) 233-4; Rona Goffen, Masaccio's "Trinity," Cambridge, 1998; Timothy Verdon, "Masaccio's Trinity," in The Cambridge Companion to Masaccio, ed. Diane Cole Ahl, Cambridge, 2002, 158-160. ^ Alessandro Cortesi, "Una lettura teologica," in La Trinità di Masaccio: il restauro dell'anno duemila, ed. Cristina Danti, Florence, 2002, 49-56; Verdon, 158-161. ^ Cothren, Marilyn Stokstad Michael W. (2010). Art History Portable, Book 4 14th-17th Century Art. (4th ed., Portable ed. ed.). Upper Saddle River, NJ: Prentice Hall.